We are currently preparing for the Bike Drive of 2018. 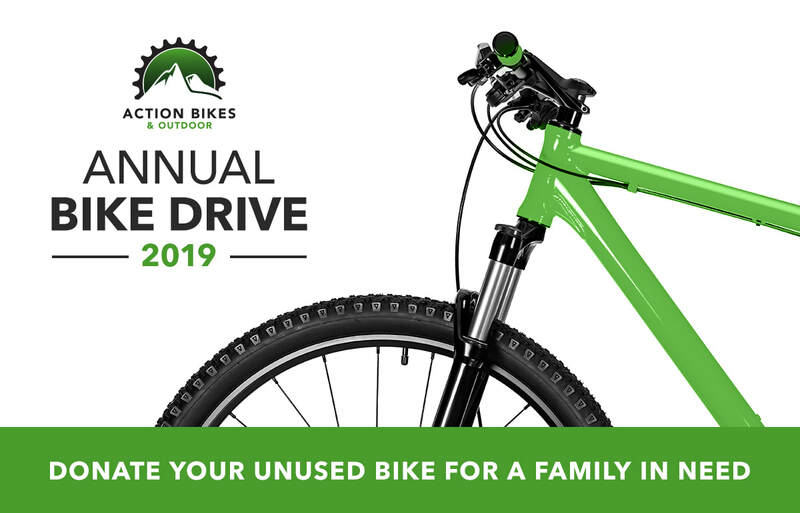 If you have a unused bike that you would like to donate, we promise to repair it, tune it up, and find a local family in need who would enjoy it. Simply drop your bike donation off at Action Bikes and Outdoor during business hours and we will take care of the rest. Our goal is to collect 50 donated bikes, repair, clean, and deliver them to families by mid December. NEW DEMO program and Bikes! Our Demo bike program is back and better than ever! ​This year we have Cannondale's Bad Habit; a super fun full suspension plus sized trail bike, perfect for the rough single-track in our local area. Come Demo one of these bikes for $59.99 per day and have the demo price refunded when you buy a bike! We have all sizes and both aluminum and carbon models. Come get on a Bad Habit and see what all the 27.5+ buzz is about! Cannondale and Thule training day. Recently our staff traveled to Cannondale and Thule in Connecticut to check out all of the new product first hand. The Cannondale staff took very good care of us and introduced us to product designers, suspension guru's, sales representatives, and apparel designers. We looked at new bicycles and products being offered in 2017 and discussed the technologies that are currently being used. To top it off, Peter Sagan's custom bike raced in the 2013 Tour de France happened to be on display. Only an hour away...we visited Thule. Thule makes 80% of their products in the USA at strategic locations across the country. Not only are their designs incredibly innovative, they are tested for strength in their lab and road tested on a closed course mounted to a Volvo V60. Their rigorous tests include saltwater exposure, humidity and UV testing which simulates years of exposure to sunlight and various elements. Thule bike racks, kayak carriers, cargo boxes and accessories are superior for a good reason! Each year we host a bike drive for kids that are in the need of a bicycle. If you have a bike that is no longer in use, you may donate it to Action Bikes and Outdoor in the Fall. We will then clean your bike, repair it if needed, check it for safety, and donate it in the month of December. Fortunately we have been able to donate over 50 bikes each year and are grateful to have such generous customers who support us. We are also very fortunate to have supporting partners that help us find families in need, and help supply us with the numerous bicycle parts needed to fix the bikes. A huge thanks goes out to our partners that include The Port Jervis Police Department, Eastern Pike Regional Police, the Borough of Matamoras, Recap Port Jervis Headstart, Empowering Port Jervis, Cannondale Bicycles, Quality Bicycle Products, J&B Importers, and several anonymous donors. Thank you so much for helping us get kids on bikes to encourage a fun, active, and healthy lifestyle! Come ride with us! We have group rides leaving the shop all the time. Rides are open to all abilities and types of bikes. We offer road rides, gravel rides, and mountain bike rides at the Watershed Trails in Port Jervis. Rides are posted on facebook and sent in our newsletter! Check out our CLEARANCE BIKES! Great bikes, Great prices: Great Deals. Click below to see what we have! This year the event will act as a fund raiser and be ridden as a Poker Ride (5 card stud). There is no need to "race" or be in a hurry. You can ride with your friends as a group ride, a personal challenge, a scavager hunt, time trial, or however you want. This is all about The Experience!! You just have to finish and make sure your "hand" is turned in by 3:00pm. There will be 5 checkpoints , 4 of which will be within the WaterShed Trail System. You will be allowed to get to these checkpoints by any route you want. The WaterShed Trail System is marke amazingly well and there will be maps available. The shortest total mileage to get to all 4 checkpoints will be about 12 miles, but again you can take the long/more fun way if you want. Get signed up now! Come Ride with us! We have group road and mountain rides going out all the time from the shop or local trail heads. Rides typically last between 1 and 2 hours and are kept at a pace that is comfortable for all the riders. If you are looking to get involved give us a call or stop by! Use #actionbikesandoutdoor on Instagram and share your adventures with us and your friends! Make that outing memorable! Just getting off the bike for a few minutes and taking some photos can make any ride seem even more worthwhile. The Outdoor Club of Port Jervis been busy this past year maintaining, and building more trails in the new watershed trail system in Port Jervis. This trail system now has over 35 miles or hand-built single-track, double-track, and some gravel power-lines. If you would like join the Outdoor Club of Port Jervis, Volunteer, or learn more....click here!